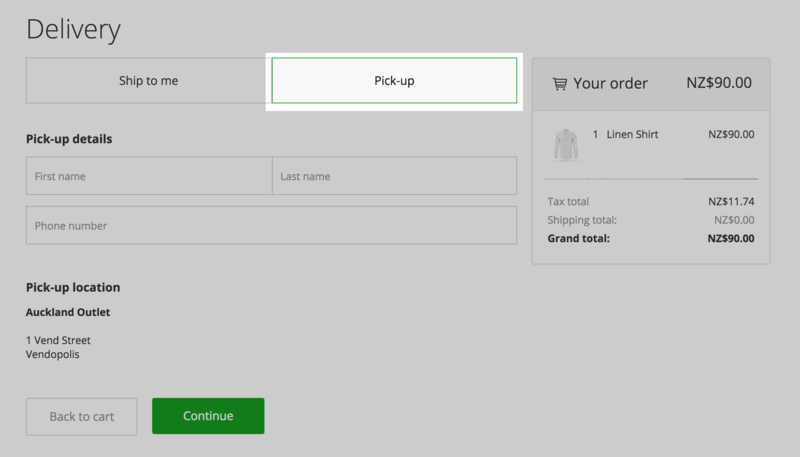 Click & Collect in Vend Ecommerce – How can we help? Your online customers can now choose the Click & Collect option when purchasing items from your ecommerce store. This allows your customers to purchase an item online and then come into the store to collect it. Click & Collect enables retailers to pick up their items right away rather than wait for shipping, provides an incentive to bring your online customers into your store and gives you a competitive edge over online-only sellers by offering face-to-face interaction with your customers. 1. 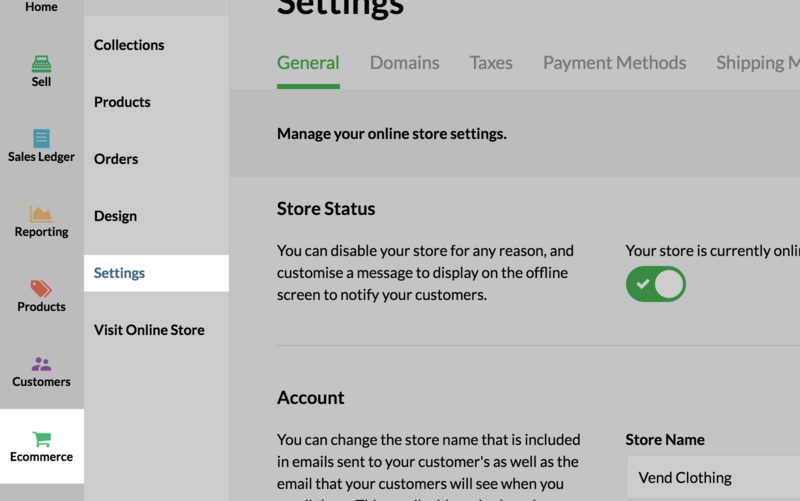 Open your Vend store on your Mac or PC and navigate to Ecommerce -> Settings. 2. Once here, use the tabs at the top of the page to locate Click & Collect and click Enable. Important: If you are a tax exclusive store, or are setting up Vend for this first time, you will be asked to specify a default tax rate for click and collect orders. This should be the tax rate used in the physical outlet where your customers will collect their orders. Add custom pick up instructions that will be automatically given to your customers upon selecting Click & Collect in your ecommerce store. Choose to include a processing fee that you will charge customers if they select Click & Collect. You can also add a negative processing fee that will act as a discount. This can be useful if you want to incentivise your customers to pick up from your store. Tip: If do not want a processing fee, leave the number as 0. Change the address which will be given to customers when they select Click & Collect. This will be the address associated with your Vend Ecommerce outlet. In this same section you can also change the the default tax rate for click and collect purchases.This should be the tax rate used in the physical outlet where your customers will collect their orders. Once you're happy with your changes you can exit the page. Any changes or additions made during the setup process will have been saved automatically. When your customer has selected their item(s) and proceeded to the checkout, they will be prompted to pick between "Ship to me" or "Pick up instore" as delivery options. Once your customer has chosen Pick up instore, they will be asked to input their name and phone number before moving on to the payment options screen. When your customer has chosen the Pick up instore delivery option, they will be able to select one of the normal payment options that are available on your ecommerce store. 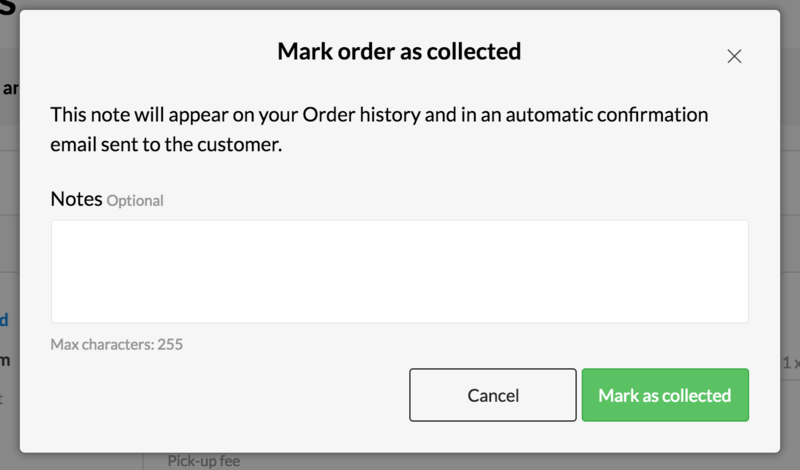 After your customer has completed the steps above and placed their order, they will receive an order confirmation screen that includes the address of the shop where their new item(s) is held as well as any additional pickup instructions you have specified. 1. 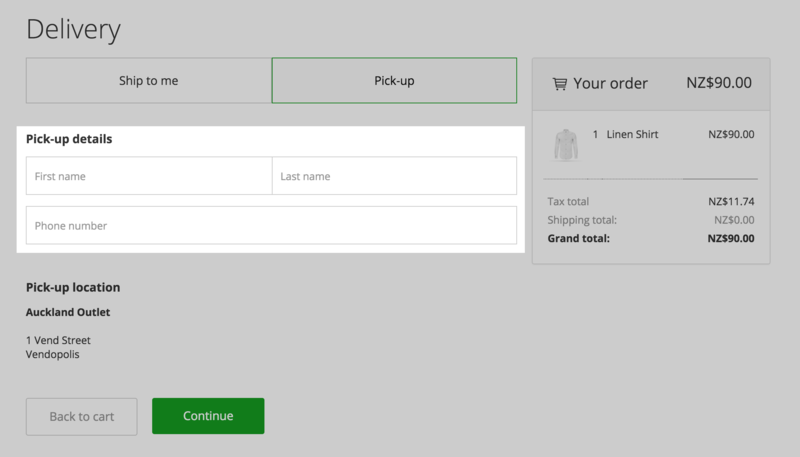 Navigate to Ecommerce -> Orders in Vend and locate the order that your customer has come to collect. 2. Click the Mark as collected button. 3. You will be given the option to add a note detailing the customer who collected the order and the time that it was collected. Once a sale as been marked as collected an email will be sent out to the customer, letting them know that the item(s) they purchased have been collected from your store. 2. Click on this order and select the Mark as paid button on the right. Once the order is marked as paid you can mark it as collected following the steps above. How can I change which outlet is used for Click & Collect? The outlet that is selected for Click & Collect is the same outlet that your Ecommerce site uses to source inventory and posting sales to. If you want to change the outlet for Click & Collect it will also mean changing the outlet that your Ecommerce site uses to source its inventory and posts its sales to. To change the outlet, please contact support. Can I choose to display multiple outlets for pickup? No, you can only associate Vend Ecommerce with a single outlet at this stage. How do I change the address that is displayed for pickup? The pickup address information for Click & Collect is taken from the address of the outlet associated with your Vend Ecommerce store. To update the address, head to Vend -> Setup -> Outlets and Registers. Find the outlet and select Edit Outlet to update the address. How do I identify which orders need to be picked up? Head to your Orders page under Ecommerce and click on an order to expand it. Orders that need to be picked up will have the heading "Pick up from" as opposed to "Deliver to" in the order address section on the left.